The Olympics of 2012 introduced a global audience to the often hidden delights of Hadleigh in Essex, such as the superb Hadleigh Country Park where the Mountain Biking was held. Whether you have lived in the locality for years and enjoyed parts of the Park and Farm or are a welcome guest, this guiding map offers fresh dimensions for new visits. Developed to display the results of an elegant interplay of artwork and historic research, the Illustrated History Guide and Map shows handy distance scales, where to walk, things to be seen and time-capsule views of what was once here. The cover picture from the first step back in time, to about 1935, shows Frederick Wanstall, Hadleigh Farm’s last shepherd, exploiting the lush grass which is now so good for picnics and family days out. 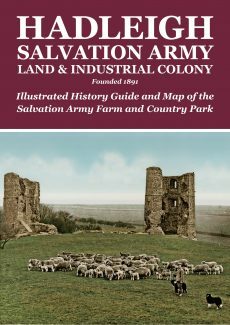 Inside the guide there is a summary of the Salvation Army’s inspirational work at Hadleigh Farm to counter deprivation in London at the end of the 19th century. In just a few years, they had built, transformed and developed . . . . but why not buy the guide map, walk the trails and see what happened for yourself? Liked the church fete archive stand. The day before saw a kestrel perched on the left tower of your picture when walking around the castle ruins. It stayed still for over 20 mins.